is what I came home with! 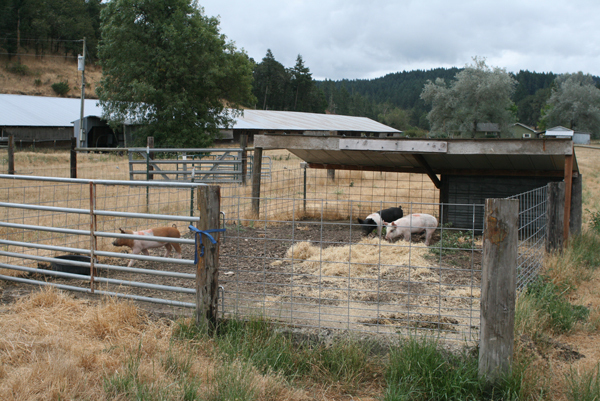 We raised pigs a couple years ago and still have the pen set-up. Our property has several large concrete pads that are leftover from the chicken barns. 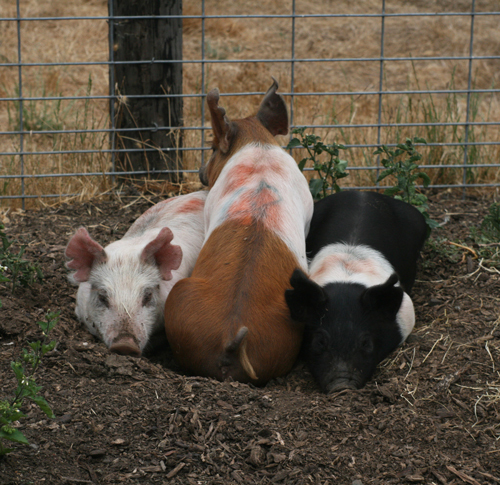 They make a great foundation for a pig pen. 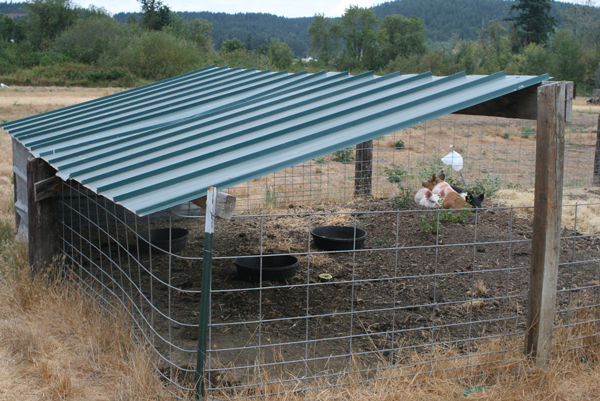 We used hog panels for the fencing and leftover roofing material to make a 3 sided shelter. 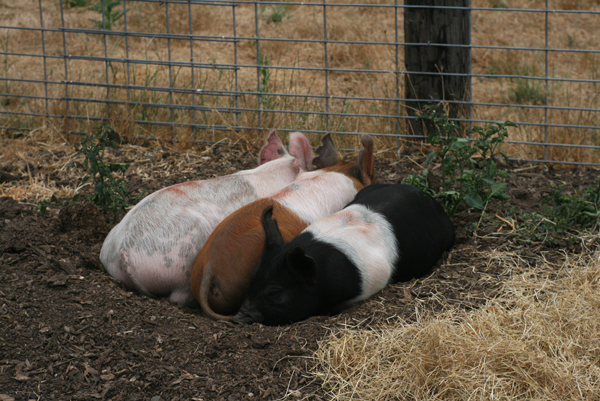 I would love to give them access to the pasture, but pigs are very good at rooting around and can pick up field fencing and go under very well (been there, done that). 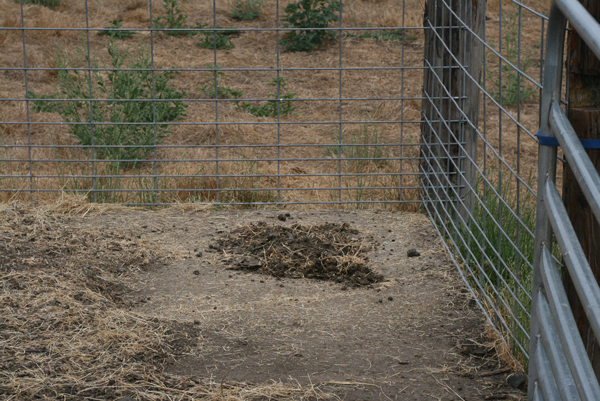 An easy solution to this problem is to put a strand of electric at the bottom of the fence, but this pasture is too large. So, they are having fun rooting around in the leftover wood chips and eating veggies from the garden. Their first order of business was digging this bed for the three of them to sleep in. My first order of business was training them where to go to the bathroom. 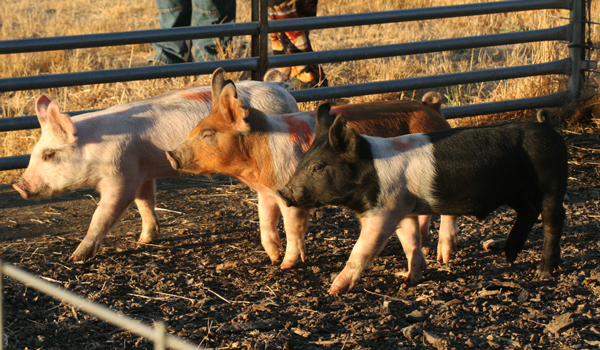 Pigs are very clean and prefer to go to the bathroom in one spot. Unfortunately, they chose a spot under the shelter and I would prefer they use this corner. So, I am moving their waste to this corner until they have it figured out. It makes cleaning the pen a snap. One shovel load out of the corner in the morning and night is all it takes. and my favorite – a pink boy with gray spots around his eyes. 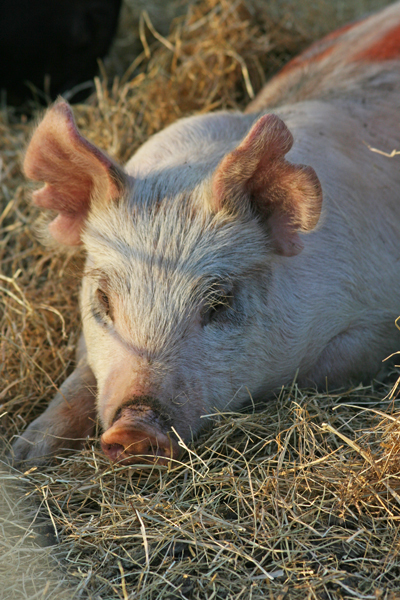 Pigs are amazing animals – they are smart, cute, clean, and very efficient at turning food into meat. For now we are enjoying the cuteness! I would have trouble eating something I had so much admiration for! The part I really appreciate about raising them is that I know they were raised humanely with compassion. I know they were fed a healthy diet and I know I am feeding my family a healthy product. I am afraid I would get too attached to them to eat them! But I agree with you on knowing that they had a humane life….. I second that Shannon… especially with pork. 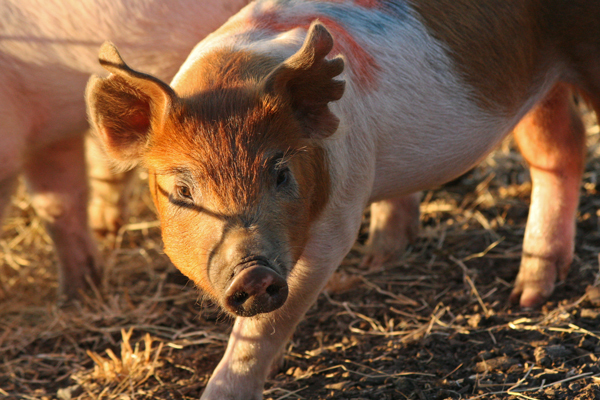 We don’t eat pork but I can sure appreciate home grown way above store bought, especially with pigs. They certainly don’t lead very good lives and are usually fed badly. I bet home grown pork is actually tasty too! 🙂 I like your red/white girl, she’s so pretty! 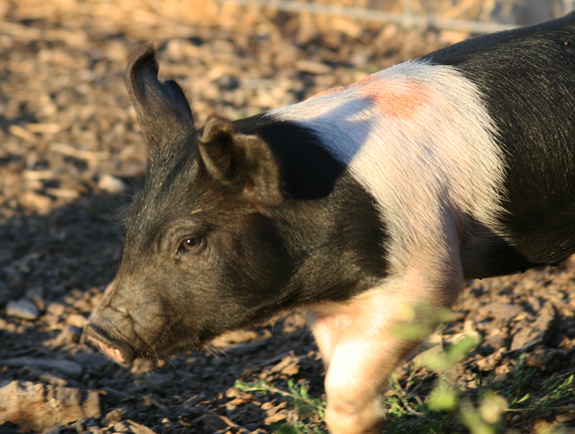 They are adorable at this stage but I bet when they are large you will be ready to put fresh homegrown pork in your freezer. There is a DVD called Food INC. that I watched recently that was very eye opening about what our purchased food supply is really like and not what they want us to believe. I really like your page and info! It gives me great advice for our own ranch here in Pine, Colorado!!! Keep up the great work! Thanks for the article. We are wanting to do the same thing and I have had a hard time finding quality pictures of pens. Your article covered a lot of my questions.